Old or broken sewer pipes may result in extensive and expensive repairs. It can also cause a significant amount of damage to your property and even lead to serious health risks. 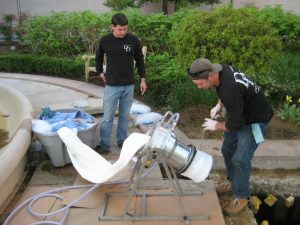 Fortunately, Nu Flow Technologies is your number one source for quality yet affordable sewer repair in Enid, Oklahoma and the surrounding areas. As industry experts, our team is available whenever you need us. So what causes sewer line damage? There are actually a few common occurrences. Cast iron sewer pipes, which were used long ago, may be suffering from corrosion and or rust due to age. This eventually leads them to form rotten spots, which eventually turn into breaks and collapses in the pipeline. Clay sewer pipes, which were also used long ago, tend to become brittle with age. They will eventually crack in multiple areas. Over the last twenty to thirty years the majority of sewer pipes have been manufactured out of a plastic PVC material. Nu Flow Technologies incorporates the use of high-tech equipment, methods, and materials in order to fix the problem in the least destructive and most permanent manner possible at prices that will not break the bank. Although it may be easy to tell when you are suffering from a severe sewer related issue other times it may not be so obvious. If you hear strange gurgling noises coming from your toilets, there is a lack of water in the toilet bowl, or the bathtub/shower is slow to drain or not draining at all then chances are there is an issue with your sewer pipes. Although it is more durable and significantly less expensive than either cast iron or clay the pipes may suffer from cracks and breaks due to ground temperatures that are lower than the rated limits for the material. For example, in the wintertime it gets pretty cold in Oklahoma, and can even drop below zero degrees Fahrenheit. Essentaillly, sewer pipes are manufactured with a lifespan in mind, and they then become vulnerable to breaking due to age, extreme inner wastewater temperature, and outer ground pressure. If you are concerned that tree roots may have invaded your sewer lateral and may be causing an untold amount of damage, or the pipeline is showing the obvious signs of damage than contact us immediately. Do not delay. If the sewer pipes begin to leak inside or outside of your property than avoid touching the puddles or breathing in the fumes. It is raw sewage and wastewater, which is considered a dangerous and hazardous material that could very well make you sick. The experts at Nu Flow Technologies will review the situation and formulate a plan to fix it. We specialize in a non-invasive method called trenchless pipe relining. Basically speaking the damaged sewer pipes are re-lined and renewed with an epoxy resin to form a brand new pipe within the existing ones. The sewer line is cleaned and then dried. The epoxy resin is applied to the interior surfaces, and once it cures in place or hardens the new pipe is formed. Your sewer pipes can be repaired within a day. As an added bonus there are no trenches required, which means that the exterior landscaping and hardscaping features will stay intact during the process.